How Long to Give a Baby Cereal Before Starting Vegetables? The American Academy of Pediatrics recommends starting solids with rice cereal, then moving to oatmeal and the introducing pureed vegetables. However, the specific time frame for introduction varies based on your individual baby's needs. Your baby needs to meet specific physical milestones before he is ready to eat any type of solid food. Also keep in mind the AAP recommends breastfeeding your baby exclusively for the first six months. When your baby has doubled his birth weight and has head control, it is time to start solids with the approval of your pediatrician. In addition, your baby needs to have dropped the extrusion reflex; he needs to seem hungry, even with eight to 10 feedings of formula or breastmilk each day. The time frame varies between four and six months for most babies. While rice cereal mixed with breast milk is the classic introduction, no scientific evidence supports this progression. Start immediately with vegetables once you and your pediatrician agree it's time to start. A potential allergic reaction is a critical thing to keep an eye on when introducing something new into your baby's diet. Rice cereal has a low potential for allergic response. After three or more days of tolerating rice cereal with no allergic reaction, feed her a spoonful or two of pureed vegetables for three days before trying another vegetable. If she develops a rash, a swollen face, vomits or has diarrhea, contact your doctor. If she has trouble breathing, contact emergency care and remove that vegetable from her diet. While introducing vegetables, you still need to breast or bottle feed your infant. After feeding your baby by breast or bottle, provide solid food, either cereal or cereal mixed with a vegetable. Introduce the vegetable at one meal each day, whichever is most convenient. If your baby prefers, let him play with the spoon while you feed him with another spoon. If he averts his mouth from the food, don't force him to eat it. Instead, offer it again and then move on to something else. By six to nine months, your baby should move beyond just cereal. While each baby varies in development, most babies at this stage eat a vegetable or two at two to three meals per day. 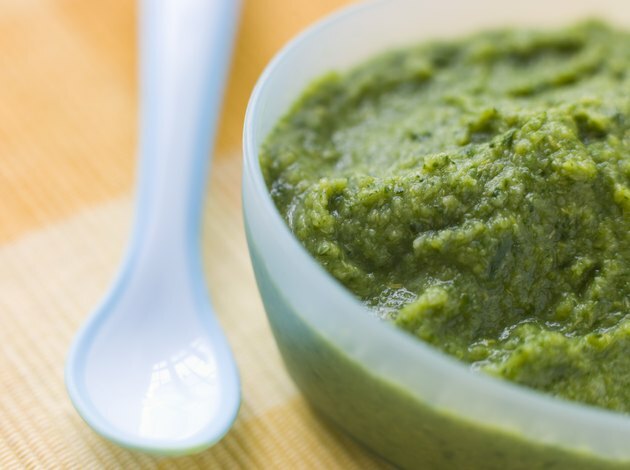 Progress him from pureed vegetables to food that is more lumpy, such as strained or mashed veggies. The final stage is finger foods, such as cut-up sweet potatoes that have been thoroughly boiled or pieces of cooked carrot. Provide a sippy cup to help with hydration and avoid constipation; fill it with less than four ounces of water to accompany his meal.